In the early 20th century, the Dennison Manufacturing Company built a business empire on Halloween costumes, pumpkin-themed party invitations, die-cut ghosts, and orange-and-black table decorations. For many years, the giant Halloween ephemera factory, originally located in Framingham, Massachusetts, employed thousands of workers to churn out crepe paper and cut-outs. The company got its start in 1844 making paper jewelry boxes. Later, it made tags for labeling merchandise. 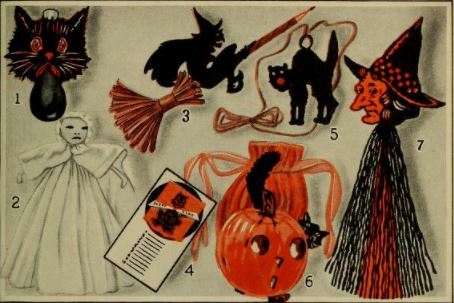 But for the Halloween ephemera collector, Dennison is famous as the company that produced vintage Halloween party items from 1909 to the 1940s and published the delightful Dennison Bogie Books – the original Halloween catalogs. Read the entire article at The New England Historical Society website! How delightful it would be to go to a vintage Hallowe’en party or dinner dance based on the 1920 Dennison Bogie Book!